On entering Bath, at the end of the A4 dual carriageway veer left towards Newbridge. After the Boathouse Pub on the right hand side is the Newbridge Park & Ride. The bus stops outside Pizza Hut on Westgate Buildings. Walk along Westgate St, continue into Cheap St. At the end of Cheap St turn left and walk up High Street. With Waitrose on your right, the road forks either side of a church. Take the left hand fork, this is Broad St, Audience is towards the top of the road on the left hand side. Leave the M4 at junction 18 follow the A46 for about 8 miles to Bath, then join the A4 (London Road) into the city. At the end of London Road, take the left hand fork into Walcot Street. Parking is available in The Podium Shopping Centre at the end of Walcot Street. Alternatively, enter Bath via Lansdown and use the Lansdown Park & Ride by the Lansdown Racecourse. 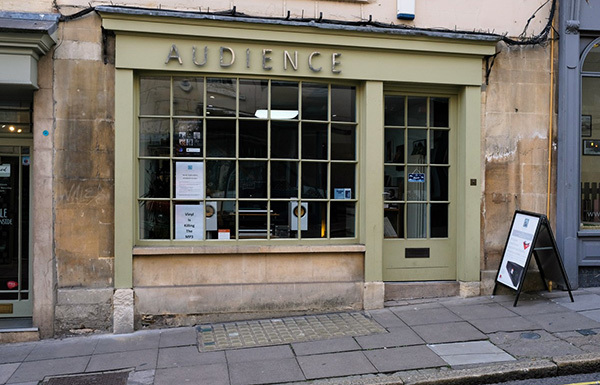 The bus stops on Milsom Street in the centre of Bath, 2 minutes walk from Audience. There is a large car park at Charlotte Street and one at Broad Street (although parking is very limited here). Hey Buddy!, I found this information for you: "Find Us". Here is the website link: https://audience.org.uk/find-us/. Thank you.